Jorge Lorenzo believes that the ability of the Yamaha YZR-M1 could still be improved. Although the first race was no longer to run, the Spanish rider is confident there will be major developments to come. 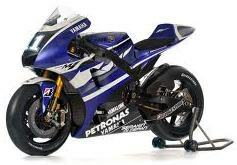 Here's Yamaha Continues to Maximise YZR-M1. Yamaha and Lorenzo is already showing promising potential that they have this season after a satisfactory performance in Sepang practice session. World champion in 2010 was registered himself as the fastest on the first day, and sit in the top three and two in the next two days. But it was not the best ability of the YZR-M1. With still about two months before the first series was held, Lorenzo believes the performance horse can still be improved. "We still continue to develop the motor, because there are big changes happening. 200cc larger capacity, greater strength, more weight and you have to hit the brakes and pull over in a softer gas, and uses more power as it passes through the corner," said Lorenzo in the official MotoGP website. Continued Lorenzo, Yamaha just needs to develop a small fraction of the current condition of the bike to be a championship contender. And the first race in Qatar is expected later stages of development to achieve the desired. "I think we're just a little behind with our competitors. This bike has great potential. We still have to do some things but we can still develop it. With 2% (development) we will be able to perform very well this year," complete Lorenzo.